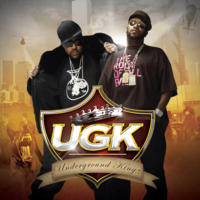 Underground Kingz is a self titled double album released by rap group UGK on August 7, 2007. It is the fifth studio album by UGK. The album includes collaborations with Z-RO, T.I., Talib Kweli, Rick Ross, Jazze Pha, Kool G Rap, Big Daddy Kane, Slim Thug, Dizzee Rascal, Too Short, Charlie Wilson, Middle Fingaz, OutKast, Three 6 Mafia, and many more. Production mainly came from Pimp C, N.O. Joe, Lil Jon, Jazze Pha, Swizz Beatz, DJ Paul & Juicy J, Scarface and Marley Marl. The first single was believed to be "Stop-N-Go," but it was confirmed that the first single was "The Game Belongs To Me", produced by N.O. Joe. The second single was "International Player's Anthem (I Choose You)" featuring OutKast, and the video was released on 106 and Park, June 16, 2007. The track is a remix of "Players Anthem" featuring Three 6 Mafia (both versions were produced by DJ Paul and Juicy J). The video was awarded Video of the Year at the 2008 annual BET Hip-Hop awards. The song has been nominated for the Grammy Award for Best Rap Performance by a Duo or Group. This song was #10 on Rolling Stone's list of the 100 Best Songs of 2007. The song hit #70 on the Billboard Hot 100, making it their only song to chart there. Pitchfork Media's "Top 500 songs of the 2000's" listed the song at #43. The album debuted #1 on the Billboard 200 with 156,000 copies sold in its first week. It was their first album since Pimp C had finished serving a lengthy prison term. The album was also Pimp C's final performance before his untimely death on December 4, 2007 in Los Angeles, CA about four months after the album's release.